Eleni Ioannou Suicide Memorial - Suicide.org! Eleni Ioannou Suicide Memorial - Suicide.org! Eleni Ioannou Suicide Memorial - Suicide.org! Eleni Ioannou, 20, a judo champion who was preparing for the Olympics in her home country of Greece, and Giorgos Chrisostomides, 24, a kick boxer who was helping her prepare for the Olympics, were deeply in love and living together in Athens. Elini was a rising star in the Judo world. 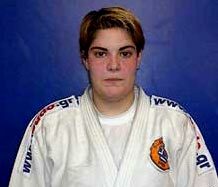 She won three national championships in Greece and took a bronze medal in the 2002 Balkan judo championships. She was hard working, dedicated, beautiful, kind, giving, and very popular. And Children loved her -- they would follow her around and ask for her autograph. "Everyone was proud of her. She helped kids in the neighborhood to have dreams," said Nikos Draoopoulos, a printer who lived across the street from the couple. And Giorgos Chrisostomides was a strong, handsome, caring, popular and talented man. He was an outstanding kick boxer and a great athlete. Everything seemed to be going quite well for the couple and Eleni was very excited about the upcoming Olympics. But on August 7, 2004, just a few days before Eleni was scheduled to move into the Olympic Village, she and Giorgios got into a quarrel. The argument started out as minor, but quickly escalated as Giorgios protested about Eleni moving into the Olympic Village - he did not want to be living apart from her during the Olympics. Suddenly, without any warning, Eleni ran to their third-story balcony and jumped off. Eleni was badly injured from the fall as she struck the concrete driveway below; her skull was fractured and several of her bones were broken. She was taken to an Athens hospital in critical condition and lapsed into a coma. Giorgos, who was obviously deeply distraught and overwhelmed from what happened, was in their apartment with friends and family the following day when suddenly he stood up and yelled, "I'm going to find Elena!" He then ran to the balcony and tried to jump, but his family stopped him. On the following day, Giorgos was having lunch with his grandparents in the same apartment when he quickly got up - without saying a word - and ran to the balcony and jumped. Giorgos was taken to the hospital with severe head and spinal injuries. While Giorgos lay in a nearby hospital room, Eleni's condition worsened, and on August 24th, 2004, 17 days after she jumped from the balcony, she died. Elini's judo coach said that she had been suffering from psychological problems for quite some time before she jumped. Elini most probably had depression. And untreated depression is the number one cause for suicide. Giorgos was also having difficulties before the tragedy, as he was depressed due to prolonged unemployment. Again, untreated depression is the number one cause for suicide. There is nothing romantic about what happened to this couple - some members of the media have ignorantly and stupidly calling what happened to this young couple a "Romeo and Juliet" story. But this is not about Romeo and Juliet, or any other story - it is about mental illness. Over 90 percent of those who die by suicide have a mental illness at the time of their death. And depression is the most common mental illness. Many people do not get help for their mental illness because they do not want to be stigmatized. And many people hide their depression, masking their symptoms as much as possible, so they will not be seen as "weak" or labeled as "crazy" - and, of course, neither of those words ever apply to anyone who is mentally ill. Unfortunately, the stigma of mental illness cuts across borders and cultures - it is a universal problem. It affects people in Greece, the U.S.A., and every other country in the world. If Elini and Giorgios had reached out for help, they could have been diagnosed and received treatment. Depression is highly treatable, and the vast majority of people who received treatment get better. There is no shame in mental illness, there is only shame in the stigma that still surrounds it, and keeps people like Elini and Girogios from reaching out for help. If you think that you or someone you know may be suffering from depression or another mental illness, please reach out for help - and do so immediately. Please make appointments with a medical doctor and a therapist so you may be evaluated and treated.